The Stewardship team is looking for a shoreline naturalization demonstration project. 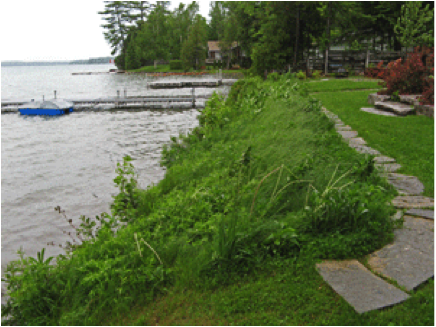 Maintaining a healthy vegetative buffer for up to 30 meters from the shoreline significantly reduces the amount of sediment, phosphorous and nitrogen that enters the lake. All of these compounds act at fertilizer, encouraging weed growth and reducing important oxygen supply for fish and other aquatic creatures. If you want to attract Canada Geese to your shoreline, plant grass all the way down to the water! For more information about this check out www.dfo-mpo.gc.ca/Library/337927.pdf. create a naturalization plan. We will then call on our junior stewardship program to implement the plan and earn Skelefin credits under the appropriate supervison. Purchase of plant materials will be the responsibility of the property owner. If you are ready, willing and interested, get in touch with Jim before July 30, 2015.